Come check out NewTown’s latest show, Design in Time, featuring two superb live duos against a backdrop of Bolshevist Constructivism. A revolutionary explosion of art and politics marches into the future of Lenin’s Red Russia and its celebration of all things Modern. Come out to Bar Lubitsch in West Hollywood November 6th to hear (and see!) 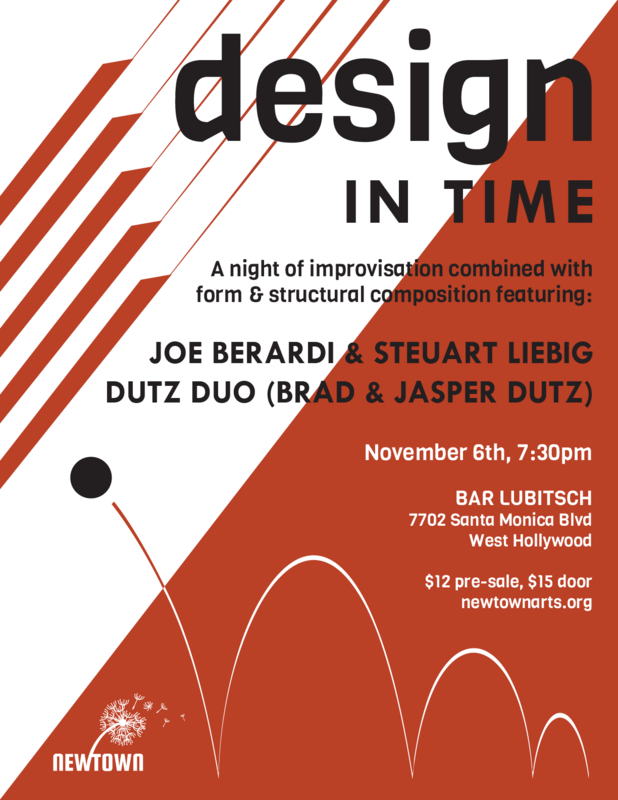 Joe Berardi & Steuart Liebig, and the Dutz Duo give a modern spin on Russian Constructivism… A night of improvisation combined with form and structural composition, NewTown will even have the added element of Constructivist films projected onto the performers. You won’t want to miss it. Door opens at 7:30PM. Design in Time will serve as the kickoff event for a series we will do in the near future involving stairwells, yes stairwells… More to come soon. Long-time collaborators Steuart Liebig and Joe Berardi are fixtures on the Los Angeles improv and New Music scene. Using electric bass, drums, percussion and electronics, they combine their sense of rhythm and groove with texture and atmosphere to create their dramatic cinematic landscapes. Dutz Duo is a father-son collaboration between Brad and Jasper Dutz that features a vast array of both percussion and woodwind instruments. The group blends elements of jazz, chamber and world music together that manifest into a whacky and virtuosic aesthetic. For the Nov 6 show, they will do a combination of twisted tunes and free form improvisations. “Art must not remain a sanctuary for the idle, a consolation for the weary, and a justification for the lazy.